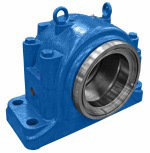 Traditionally, tubular or twin bearing housings for fans have been made in cast iron. However, when a British customer requested a special fabricated housing in steel, we produced several to a high specification. We supplied not only the fan bearing housing, but also the end covers and oil flingers. Producing two large cast steel bearing housings for a heavy crushing application was not a problem. The customer had the bearing: 23084 cck and no housing. We designed and manufactured the bearing housings from new pattern equipment inside 8 weeks. "We see the mineral crushing and metal re-cycling industry as very important markets for us - and we will be concentrating on this in 2009", explained Paul McCairn. Bri-Mac have come to the rescue of an Argentinean mine - and are producing large FSAFS 540 cast steel bearing housings. These are split bearing housings with solid bases to give extra strength. Used on lifting gear, the original housings had failed. An internet enquiry led the customer to Bri-Mac. "We are particularly proud of our efforts. From initial quotation, design and manufacture, my production team have done a great job in producing these large bearing housings for a satisfied customer", said Dave Holdnall, Production Manager. This picture shows a SG iron bearing housing type SD 3048 with special taconite seals. A customer in Germany found it difficult to get them made and Bri-Mac responded in good time. We are proud to announce that we have appointed VK LOZISKA as our exclusive agents for the Czech Republic and Slovakia. "This important area of Europe is growing fast, and by having a presence in this market, we will be in a great position to grow our bearing housing sales. With the emergence of neighbouring countries like Hungary, Poland and Ukraine we intend to be the leading bearing housing provider for many years to come", said Paul McCairn. After receiving a call from a German cement works, the Bri-Mac sales team received an urgent order to produce two off SN 648 housings in cast steel. With a special base length of 790 mm and weighing 500 kg each, we produced new pattern equipment giving extra strength to the housing base and four hold down bolts in the cap to suit the demanding and hostile working conditions in the cement works. "We hope to work closely in the future with our customer on similar projects", said Andy Holdnall, Chief Designer. Self aligning bearing housing in SG iron. We produced a batch of 48 off self aligning bearing housings for a steel mill in the Far East. The inner cartridge was made from SG Iron to suit a 225 mm dia shaft.